Taking a leap of faith, to jump right into it. Having the belief and the trust that everything is going to be okay. It is just like being a frog. Sitting on your leaf and looking at the water, the frog doesn’t put his feet in the water to see if the water is warm or cold. The frog simply takes a leap. He just goes for it. He knows it is going to be fine, he knows that as soon as he gets into the water, there will be food there, as well as shelter. 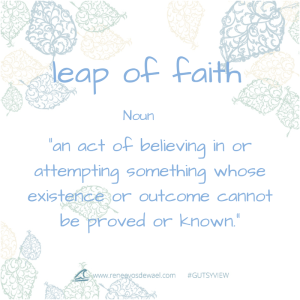 Jumping and taking a leap of faith with life can be just that. You take a step back; you look at what is asking you to have faith in it. Become the observer of everything that is happening around you. You listen to that soft, but strong voice inside of you that is telling you it is time. It is time to leap, to just jump in before testing the water. You talk to people about your plan and you get those aha moments, you walk around and you see the signs. 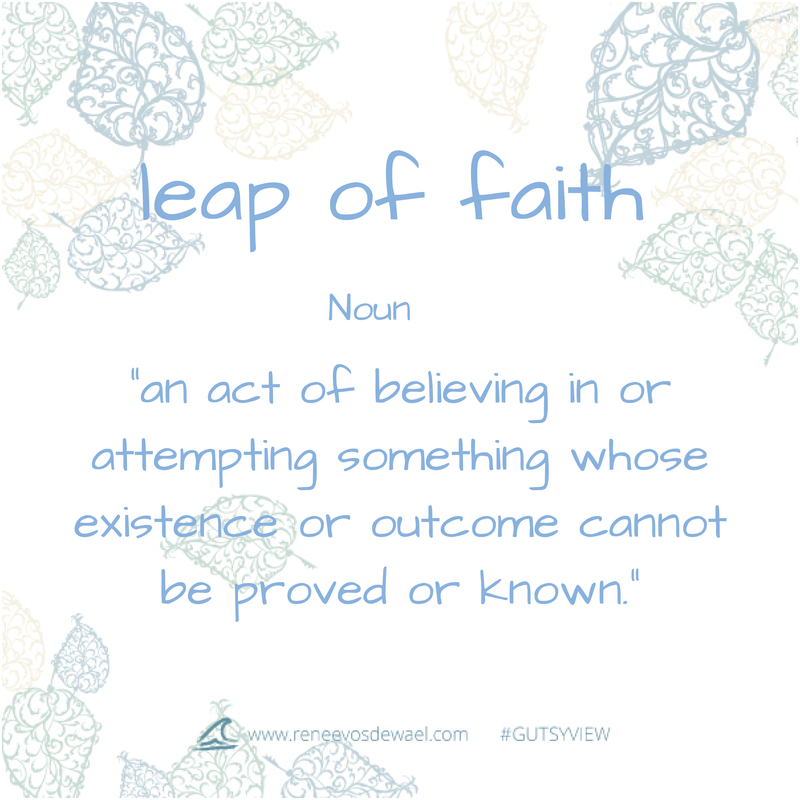 By taking a leap of faith, you trust that inside guide to follow your dreams. You know deep down that is going to be okay. Your environment around you may have many doubts, but you know, you know all is well. You know that writing that book will bring you to the next step that is necessary for your dreams to come true. You know by taking that job, which has been offered to you out of the blue, which seems too good to be true, is something you have been manifesting yourself, something you have been dreaming of while going in to work and while driving back home again at the end of the day. You know it is there for you to be waiting to be picked up. Sometimes we dream and dream, we talk about it and dream a little bit more, but for some reason we don’t pick up the opportunity’s that are there for us to make these dreams come true. Some of the opportunities are right in front of us, inviting us in to take a change. If you look around you, there are always little things that tweak your opportunity. You get a chance to speak up during a meeting. These are the moments for you to present your unique ideas for the magazine or that great marketing idea for a campaign for an important client in the office. You can truly feel the energy of taking a leap when you walk through a neighborhood you would love to live and your dream home is for sale. It just fits your profile. Maybe your leap is to just have a look, perhaps if diving into the deep end is too scary to start with. There is nothing wrong with stepping into the paddling pool first. But take a small step, make sure you are in motion. Have a feel for what the house feels like, how the new office looks. Nominate yourself for a new project, just go out there and try. Jump in and see what it brings you. Maybe it is not what you thought it would be like, and that is okay. You need then to alter your dream, your vision. You will always walk about with important information, to build and manifest something even better. If you only keep dreaming, only keep looking at what could have been. You will never figure it out; you will never have a taste of what it is like. Let’s be bold, let’s be brave, let’s leap in. Let’s not put our toe first in the water to see what the temperature is like. Just leap in, write that article, take that job, buy the new car, or buy that dream home. These steps will bring so much more that what we can dream of. It will be better and more beautiful. You’ll surprise yourself. 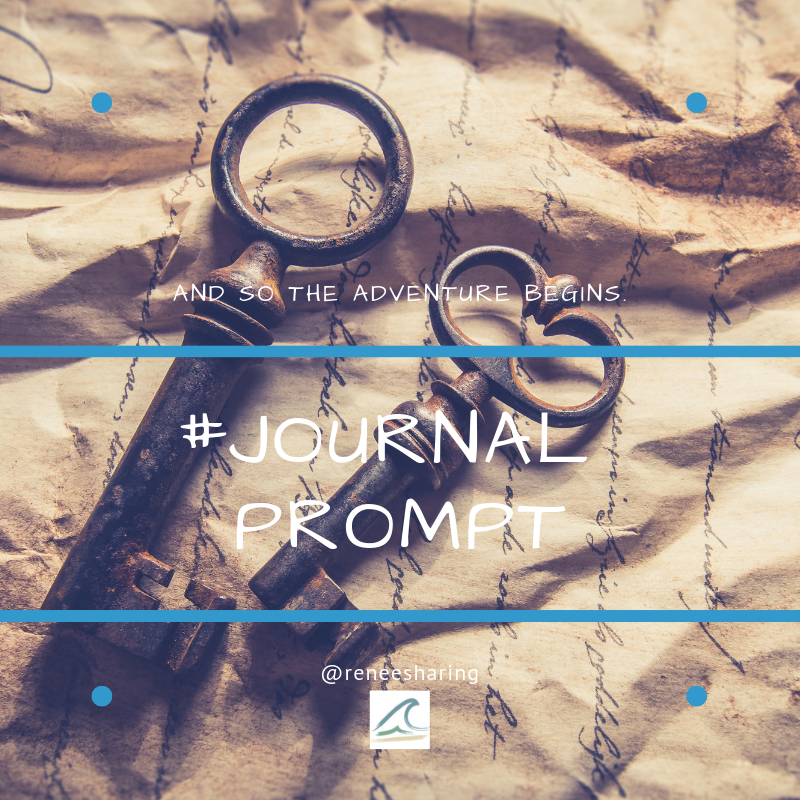 This entry was posted in Personal development and tagged Coaching, emotions, frog, good vibes, Gratitude, inspiration, intuitive, jump, leap of faith, Mind Body Spirit, reflections, six sensory living, thoughts. Knowing your roots helps you move forward with confidence. I’ve tried to live a life that isn’t full of regrets- even if it means taking a chance, or leap of faith, on impulse. For the most part I can say that I’ve taken chances and, for the most part, they’ve definitely payed off for me. This was a beautiful post. Jump right in, yes, but be prepared too. Do your homework — research, planning, and other preparation, and then you won’t jump in over your head! Great site here. Thanks for sharing. Thanks for dropping in, you are very welcome! Very happy to hear from you.